Pizza pie is an open canvas, you could go wild and top this yummy crust with anything. My pizza's are always different. 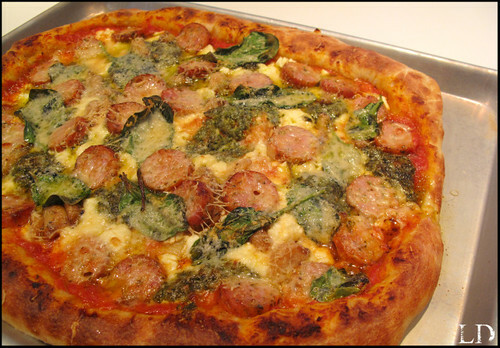 This particular pie is topped with, store bought Mariana sauce, basil pesto, feta cheese, freshly grated parmesan cheese, fresh basil leaves, and Italian chicken sausage. Turn dough out onto a clean, well floured surface, and knead in more flour until the dough is no longer sticky. Place the dough into a well oiled bowl, and cover with a cloth. Let the dough rise until double; this should take about 1 hour. If you are limited on time sticking the whole bowl into a warm oven (200˙) works beautifully. Punch down the dough, and form a tight ball. Allow the dough to relax for a minute before rolling out. Use for your favorite pizza topping recipe. I can't believe it! You can make pizza too?!?! Wow! I'm speechless Laura! Your talents never cease!